You're gonna have one helluva time trying to wring 320hp out of that in NA form. 100hp/liter is pretty respectable, and probably achievable. Even still you're looking at a big bump in compression (race gas), gnarly cams, balancing to bring the redline up without grenading the motor, and a serious port/polish/valve job. Can you bore that block to accept the 2.5 pistons? you're also going to have a difficult time mastering the car if you're building a motor with that much power. I'd focus on reliability and longevity during the rebuild... so you know you can add power in the future and the engine will handle it. @benny: The Cosworth head is actually very good. From what I understand, the valves are just a wee smaller than what was used in race-trimmed 2.3-16s, and a P&P isn't as necessary. As for the pistons, there are 2 types of 2.5L motors. 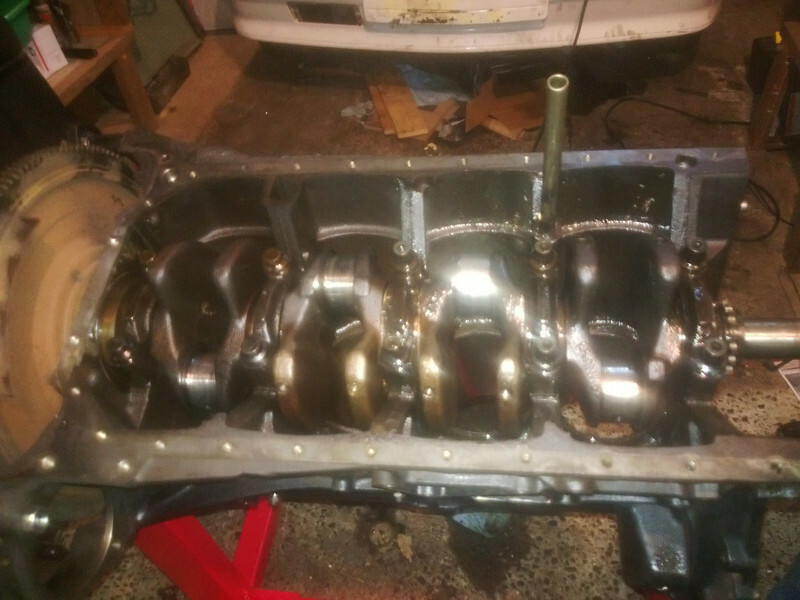 The 190E 2.5-16's motor is actually a stroked version of the 2.3-16 with a double-row timing chain (mine's a single, but I can install the double). In the Evo cars, since they were detuned versions of DTM cars, were the same stroke and larger bore. Unfortunately, MB used a different block for the Evo motors. From what I've read, mine (which shares its block with the standard 2.3 8v) doesn't have much room for boring out before you get too close to the water jacket. Long story short, I'm thinking F/I is the way to go since it still gives me a chance to see what the base motor can do when you take off that stupid intake and give it proper fuel injection. Last edited by ExplosiveToaster; 2013.09.19 at 20:13 PM. It's been a while since I've been on 190rev, but anybody on there got dyno sheets to back up their claims? Going from 149hp up to 200-230hp with intake, exhaust, and EFI sounds very optomistic to me. In any case, I bet that thing would sound wicked with a set of ITB's on it. I'm talking 200 crank BTW, an increase of 33hp over the stock NA motor. The Euro engine put out even more with a bumped up CR. From one dyno on the forum, the street version of my exhaust + lightweight pulley brings an ECE motor up to 194bhp (150rwhp w/ 23% drivetrain loss). Last edited by ExplosiveToaster; 2013.09.20 at 20:19 PM. I work really slowly when I'm doing something big for the first time So the engine and transmission are out of the car now and still on the crane. Tomorrow (or sometime this week) I'll get to work separating the two and getting the motor up on the stand so I can open it up. Last edited by ExplosiveToaster; 2013.09.22 at 19:47 PM. I got back to work on the engine tonight. 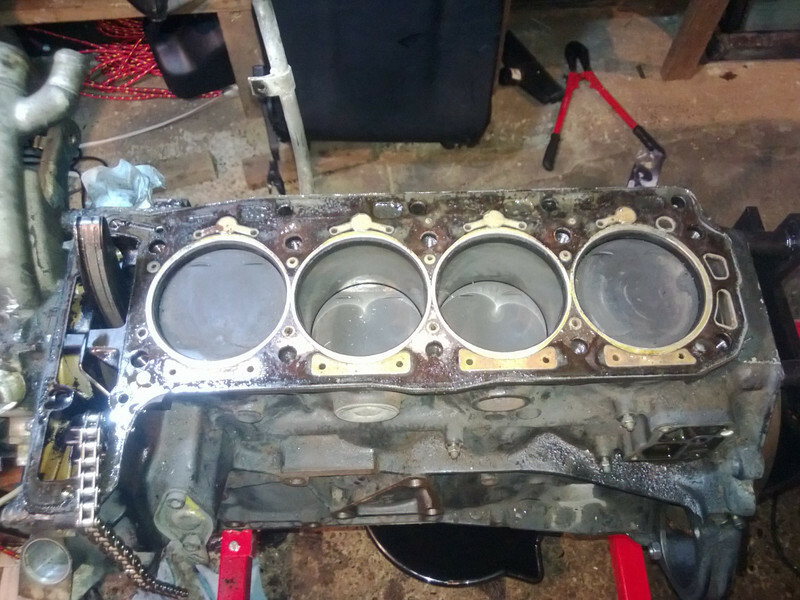 Got the cylinder head removed, then flipped over the block and removed the oil pan to get a good look at the damage. 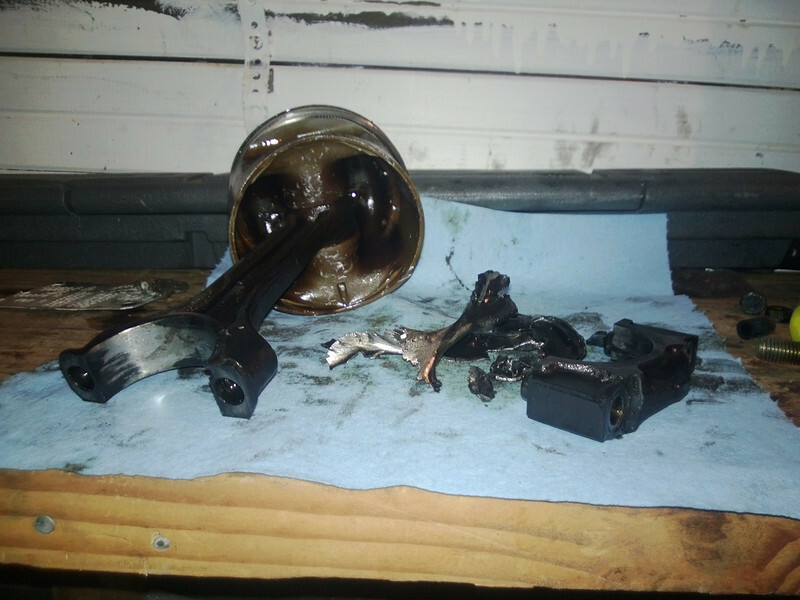 Fortunately, it looks like the failure was just a bearing between the crankshaft and cylinder 2's connecting rod, so I don't think the block took any damage in the failure. All the noise was probably the bits of bearing smacking against the oil pickup cover plate, which I can't quite figure out how to remove (I removed its 6 bolts and the nut holding it to the pickup, but the pickup tube and dipstick tube hold it in place). ^^ There's the cylinders. Those walls still have the cross-hatch pattern on the sides, and with an initial looking-over, I didn't see any scoring! ^^ "Carnage" shot showing all the debris on the oil pickup cover. There were a few more bits of metal caught in the pickup's strainer screen. ^^ This is the part I can't quite figure out. That bolt is backed out all the way into the crankshaft bearing cap. 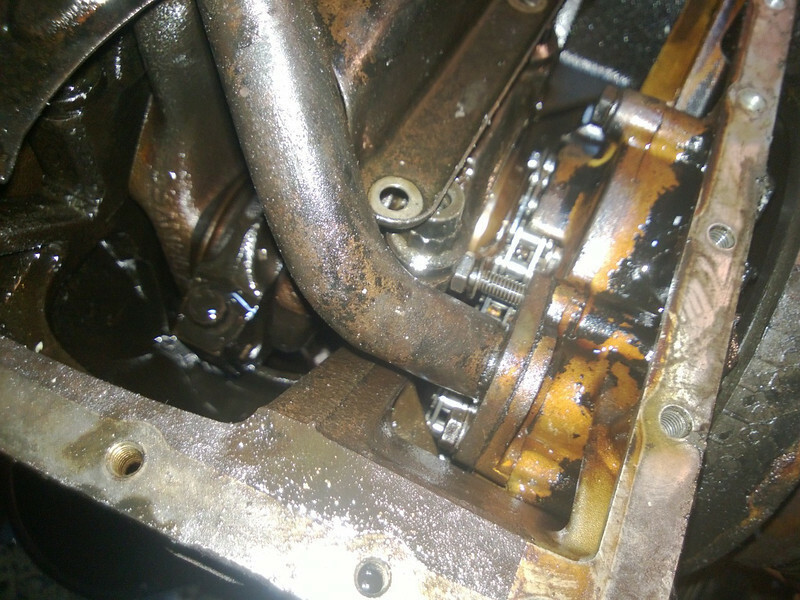 I'm wondering if I'm supposed to remove the oil pump and pickup with the timing cover. ^^ A peek at where all that metal debris came from. 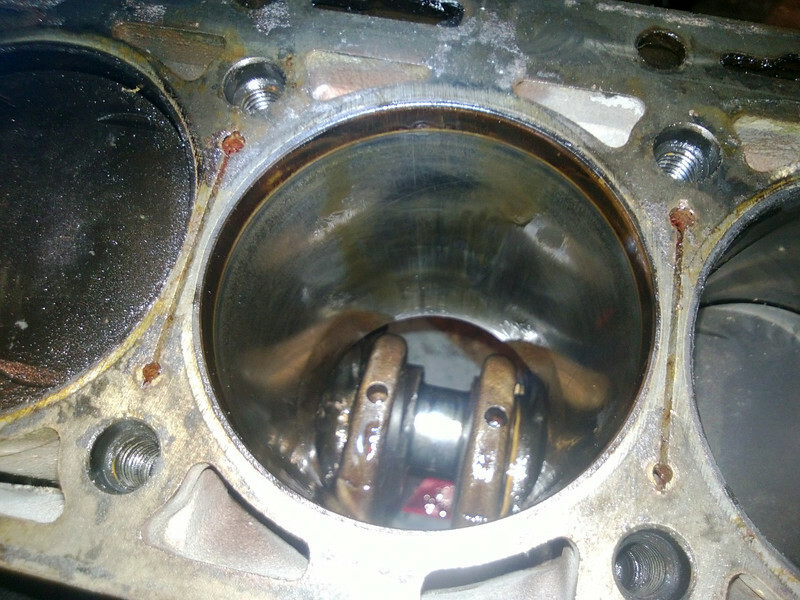 That's what happened to my VR6, but it was the #1 rod bearing. Roached the crank and rod. the bearings are the one thing I'm worried about on the M3. The top end looks good, according to the tech who looked at the car a few years ago, but the bearings are known to go at some point (well above 200k miles.. but with a track car, it's obviously a concern). I'll probably replace them when I go to install an oil pan baffle, secure the oil pump nut, and install a reinforced pickup tube. Today it came! So I went to the garage and got to work. Makes the process of removing the crank bolt and flywheel bolts super easy, and all you have to do is place the plate through the inspection hole and use the supplied bolts to secure it to the block. Diagnosis is actually pretty good. The block more or less looks OK. When cylinder 2's rod bearing let go, the sides of the piston rubbed up against the cylinder walls (there's visible wear on that piston too). But there's no huge gouging or anything, so I think the worst case is the block needs to be bored out to 1st repair (96mm). On the downside, the crankshaft journal for cylinder 2 is pretty scratched up, so I'll have to see if its repairable or if I'm looking at a new crankshaft. 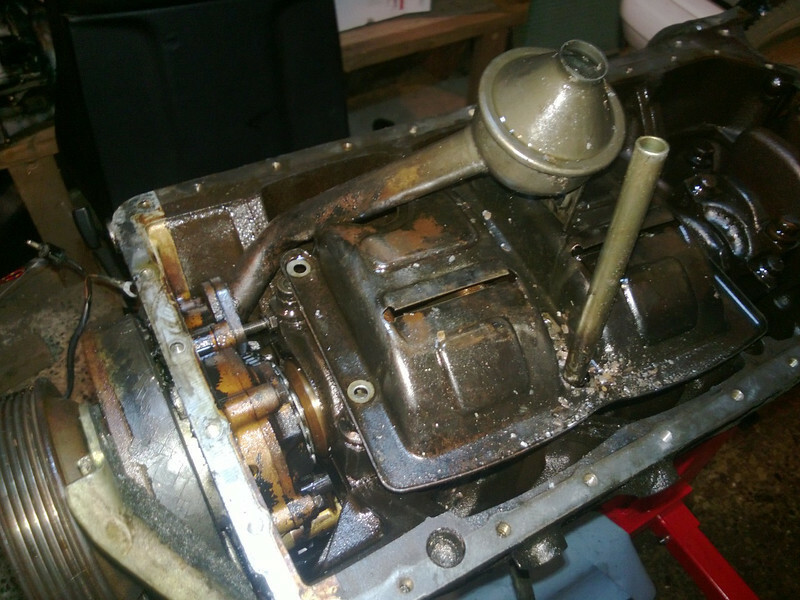 I removed all the pistons tonight, and tomorrow or Sunday I'll briefly take the block off the stand so I can remove the flywheel, and then set to work getting the crankshaft out. 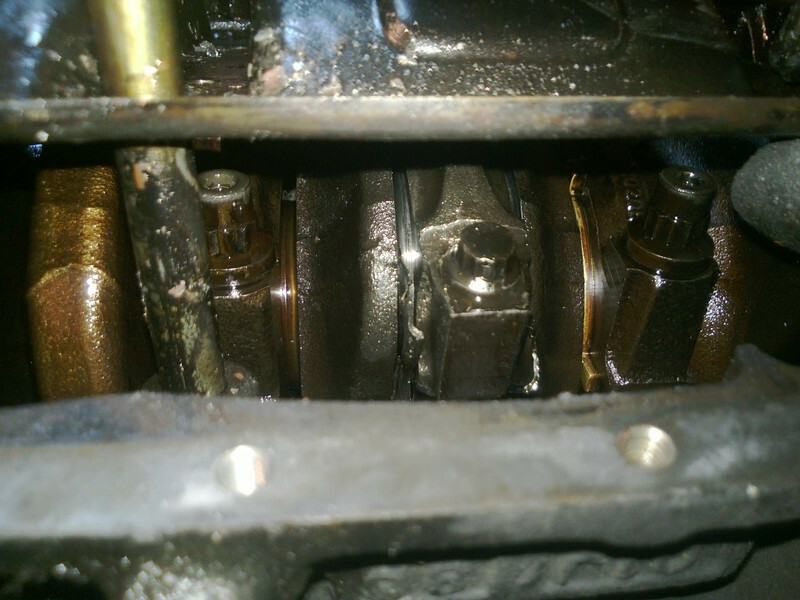 A kinda-crappy picture of the crankshaft exposed. The lighting in my tiny garage isn't the greatest, but I'm just happy I have a garage to work in!! You can't see it, but cyl 2's (2nd from right) journal has scratching and gouging I can feel with my fingernail while the other 3 journals are totally smooth. Can anyone recommend a machine shop in the Seattle/Bellevue area? I want to have the block checked over and magnafluxed to make sure everything is good (it does have over 200k miles on it, after all). Also the whole block could use a thorough cleaning. I wiped down the sides with a generous amount of Simple Green Motorsport and it got the first layer or so of grime off. There's still a lot left on it. Last edited by ExplosiveToaster; 2013.10.11 at 21:51 PM. Autosport is a great machine shop it's right next to the Ballard bridge(was downtown for years). In the meantime I'm spending some time on the interior, trying to get the pillar trims out and remove the unused seatbelts. what are you using to drive this engine block around? Your gti? Hatchbacks are good for something. I might be picking up a whole mk2 vr6 swap in mine, haha. I called Autosport to check on their progress. The crankshaft is bent (~1.5mm), but can be repaired and reused. The block is OK, just needs to be line honed. I'm having them mag the crank just to make sure there's no defects in the metal before doing any machining. The labor costs are still cheaper than a new crank, and they know what I plan on doing with the car, so I think I should be good to go if the crank turns out OK.
Of course, I'm still a little concerned about what could've happened to the metal when it bent. That thing easily weighs over 40lbs, so it must've taken a lot of force to deform it. Are they going to straighten it and do a grind / hard chrome plate / grind operation on the journal? 1.5mm sounds like a pretty sizeable bend, but I don't know what the limits are for that sort of thing. I suppose it depends on how the crank was made to begin with. can I ask how much the engine work is costing? I'm going to have a more thorough discussion before having them do anything, but the number I got over the phone for line honing the block and repairing the crankshaft comes to about $770. I'm not sure if that also includes any costs incurred so far for the initial inspection work.